Always best to hit the road after that snail-like rush hour Chicago traffic. Racers like to go fast…even if it’s on the way to the track. Bart’s first destination was Oshkosh, WI to see Jason Farrell. 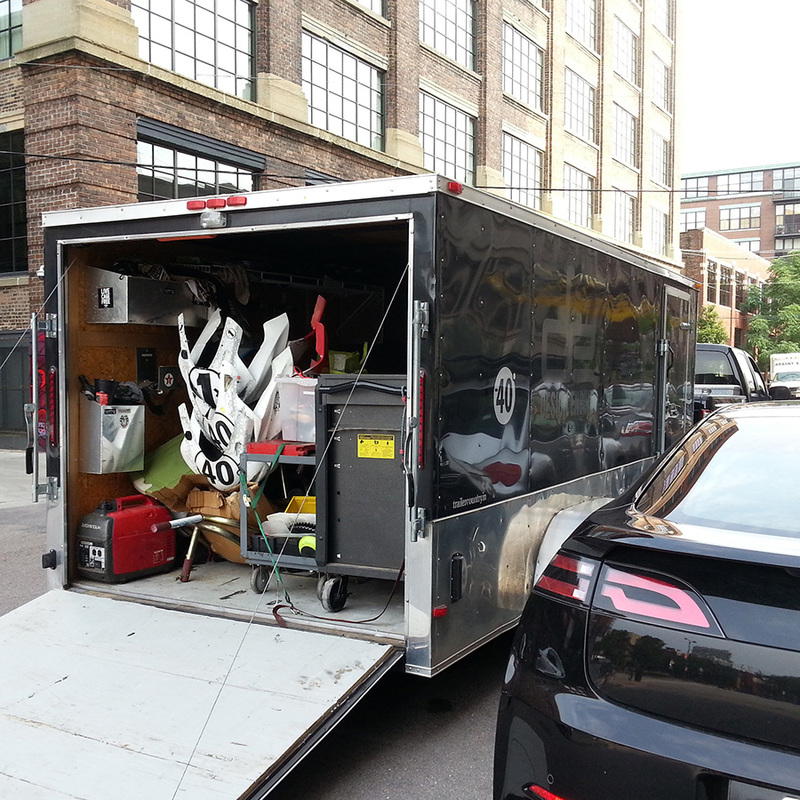 Brian picked up the fairings from Tea Palella, who was challenged with designing something new graphically for the Design Engine Racing Team. They had designed the graphics in the past but wanted a new look (Design Engine has been so busy lately) so we enlisted Tea Palella’s company Pop Shadow, to come up with something giving her creative liberty AND only a 4-day deadline. 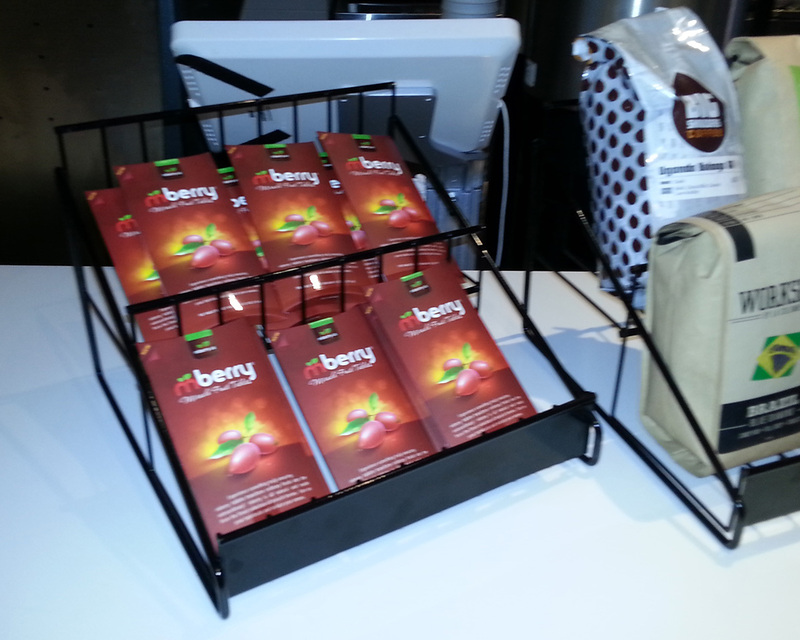 Thanks to Tea and Pop Shadow for delivering an awesome new look in time for the race weekend. A past participant of Design Engine training from Mercury Marine noticed the DE rig driving through town from Farrell Performance early Thursday morning and he sent an email to Bart asking if that was him. Advertising on the trailer does work. There was rumor of a wager going around the track that Bart would crash the new bike at some point this four-day weekend, but many would be disappointed. Bart’s friends Pete and Mike came for the STT track day and pitted in the Design engine garage. It’s always great to have friends come and enjoy the fun! Motor issues would put a damper on things and we made a trip Thursday afternoon back to Farrell Performance to troubleshoot some problems. Primarily we thought it might be electrical problems, and together Jason and Brian located the culprit, an unplugged power wire to the #3 fuel injector. Design Engine’s race team got one round of practice off first thing in the Friday STT morning. The bike ran strong but leaked a bit of oil. We located a severed rubber seal on the oil cooler as the main issue. But it was all play and no work. Bart had a meeting with Oshkosh Trucks that he needed to attend Friday at 11AM. Now it was back to race business and Bart needed new tires. Another visit to Farrell Performance to grab a set of tires, would leave Bart empty-handed. Farrell Performance had the trailer loaded with new rubber packed away, leaving the team to wait for new tires until Saturday morning race practice. 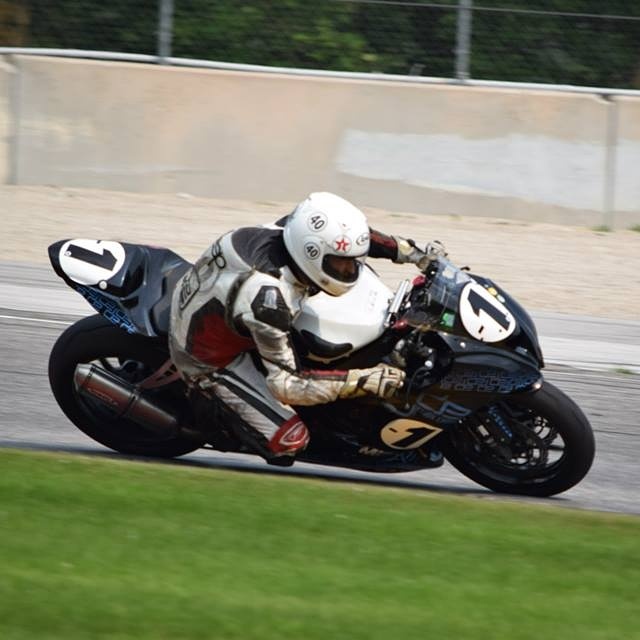 However, Bart went back to the track to go out for one session after his lunch meeting with Oshkosh and the bike ran great with the exception of that pesky oil leak. The team ripped the bike apart again missing one session of practice. If they locate the oil leak then there are two sessions of practice yet on Saturday morning. Bart and team really wanted to use these sessions to get comfortable on the bike. One session, Bart would focus on T3 and T7. Another session, Bart would make a conscious effort to focus on T12 and T14 and so on. Without the day of practice, it’s too much to conclude all the turns in Saturday morning race practice. We suffered with speed in the Carousel all weekend. Bart used one session to go out on the #603 Yamaha for a session. Anthony Kosinski asked Bart to race in the Team Challenge this weekend. It would be a first for Bart and something he has been asked to do in the past, but never raced. Team Chouffe hosted Friday night’s grilling action with chorizo and pulled pork tacos that included cilantro and vodka-soaked pineapple. Matt has taken over from Ricardo Valdez as master chef, and if you ask us Matt does a fabulous job… not to indicate that Ricky was a slouch. 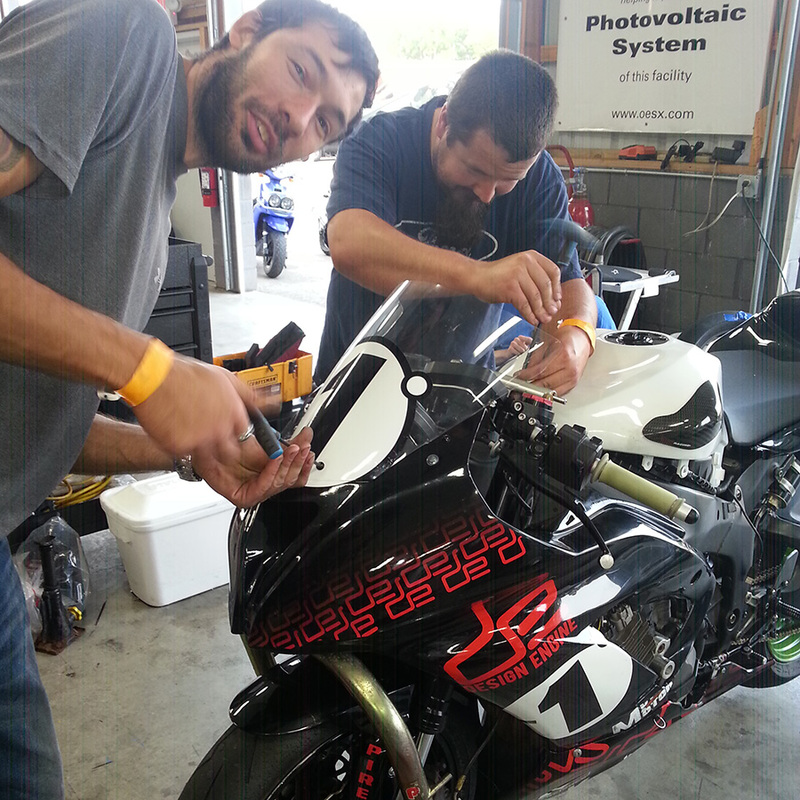 Brian & Max hard at work getting the new ZX6R ready for race tech inspection Saturday morning. Bart and Sondra like start out their typical day with yoga, sit ups or a 2 mile run. At the race track, we opt for yoga and stretching to help arm pump, reducing the buildup of lactic acid allows Bart to avoid injury and remain flexible on the bike. Sondra helped Bart stretch before Race Practice and again before the Team Challenge. Brian and Max worked on the bike all night and located the oil leak problem. As it turned out a nicked oil cooler o-ring was the culprit. Bart had a lot of work to do to get comfortable in the 14-turn, 4.2-mile track having only two sessions in practice under his belt. Ricky did well all weekend being his first race weekend in 2 years. He never sold his race bikes so it was only a matter of time before he was back in flying colors. Ricardo Valdez’s father Jose Valdez was at the race track Saturday. Ricky had an accident in an AMA race in 2013 and put his race bike away. Ricky’s dad calls Bart “Jeor Ja” because he heard that when Bart got in trouble during track days that his answer to everything was “I’m from Georgia” like that means something. It stuck. We heard that there was some betting going on that Bart would beat Ricky by 4 seconds. we like the competitive nature it creates even if only for those in the pits and spectating. Five 1st place finishes! 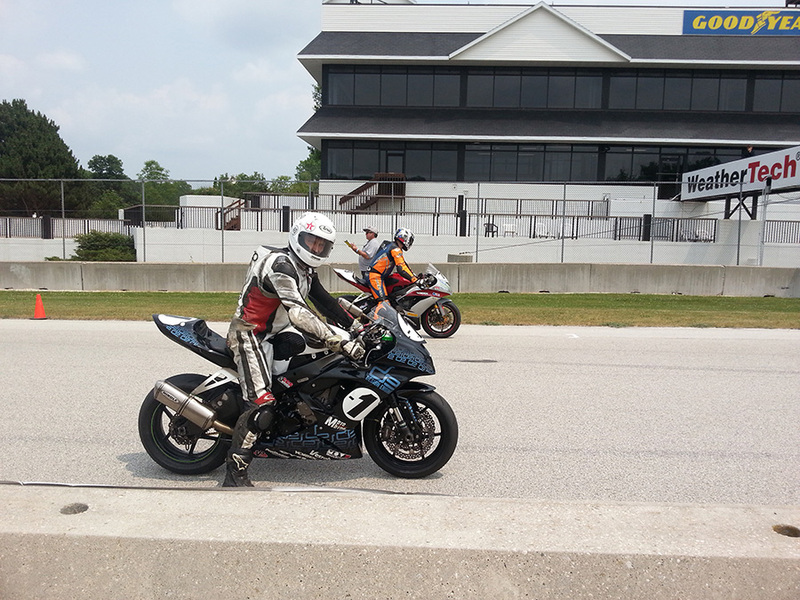 “I want to thank Brian, Max, and Jason for helping ensure that the new bike get out on the track,” Bart says joyfully. It can be a great deal of work getting the bugs worked out on a new bike. Bart finished out the day with 4 first places and a second place. Ortega and Bart battled back and forth for races 10 and 11. Ortega took first and showed Bart where he could grab more speed. Bart took first on the next race. Thanks Dan! Bart did not go out in race practice. The first race of the day was the long GTU 25 minute race, plenty of time to practice in this race. Bart decided not to mount the GoPro camera facing forward, opting for a reverse view off the rear cawing instead. It’s flat there and that view makes for an interesting perspective. 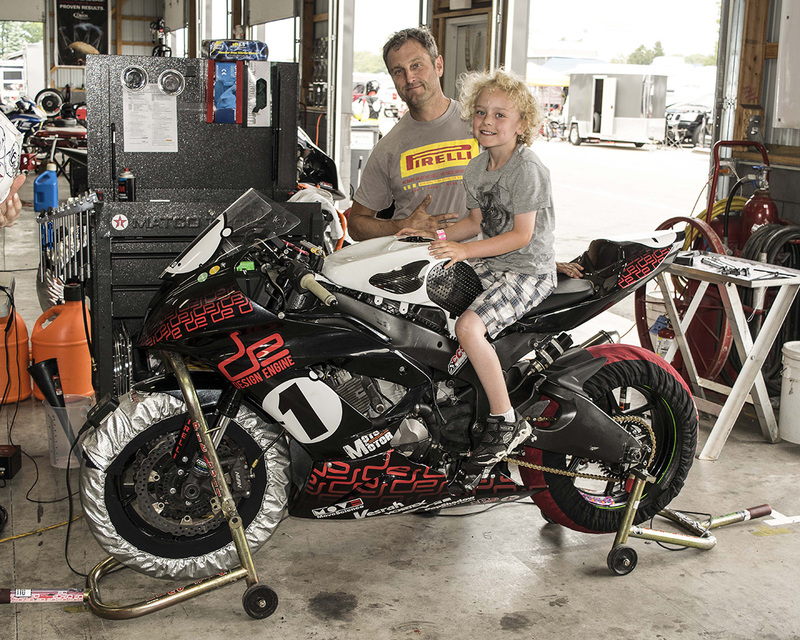 Cory West, AMA professional racer, teamed up with Mike O’Malley for the team challenge races. Bart struggled a bit at winning races, probably because everyone else had gotten their bike issues sorted out as well. Bart came in to tell the team afterwards that he felt the front tire push in one Sunday afternoon race. Ended up being too much pressure in the rear tire on one outing, causing shuddering of the front at medium or less throttle. Brake fade was a major difficulty for the afternoon on Sunday. Brian will have Brembo brakes for the next round of racing. Day two was not to be dominated by the DE Team like day one but a great ending to a race weekend nonetheless. Bart managed to stay on the bike all weekend with only a bit of run-off during one race. We did manage absolutely every hole shot of the weekend which is a first, once even from Second row. We all celebrated the weekend with a visit to EL Taco. (see video outro) Looking forward to the race weekend at Blackhawk Farms in Beloit on July 18th-19th. I struggled more on sunday probably because everyone else got faster. Brian perched on top of the squirrel fan waiting and watching for the #5 board to signify the start of the warm up lap. Road America PDF map Download this Map for your notes. Racing is all about the kids. 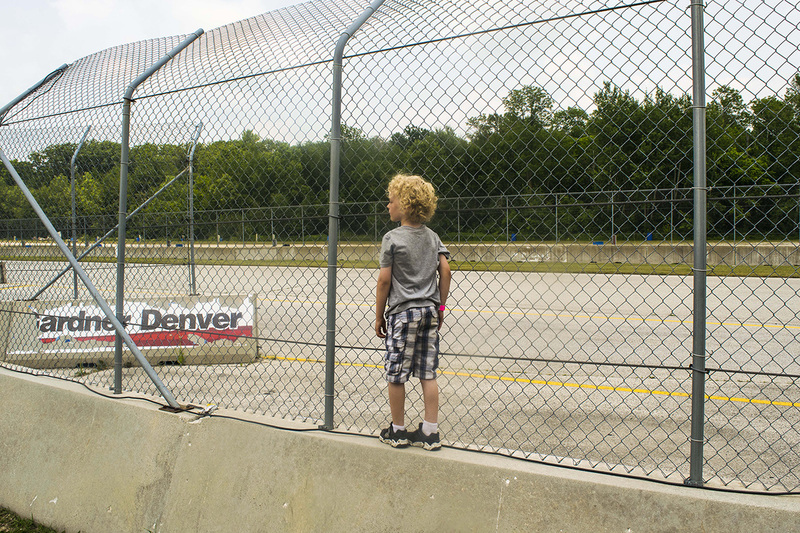 Hudson waiting at the end of the long straight at Road America waiting for Bart to come around in one of 11 races. 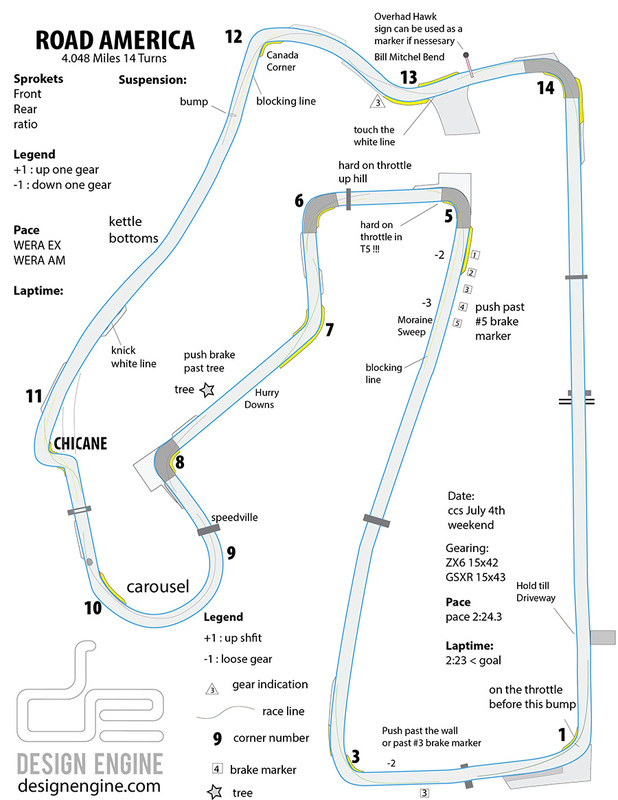 Road America track map PDF for your downloading pleasure.